امروزه جهت دستیابی به پاسخ‌های لرزه‌ای سازه‌ها استفاده از روش‌های تحلیل دینامیکی و استاتیکی غیر خطی رواج یافته است. روش‌های دینامیکی غیر خطی با وجود دقت مناسب در برآورد تقاضای لرزه‌ای، نیاز به محاسبات گسترده و پیچیده داشته و حساس به ماهیت رکوردهای زلزله نیز می‌باشند. روش‌های استاتیکی غیر خطی نیز پاسخ‌های لرزه‌ای سازه‌ها را با یک دامنه خطا برآورد می‌نمایند. کاربرد مدل تحلیلی محیط پیوسته، یک روش محاسباتی جایگزین در تخمین نیاز لرزه‌ای سازه‌ها است. چنانچه رفتار لرزه‌ای سازه با اندرکنش دو کنسول معادل خمشی و برشی مدل سازی شود، می‌‌توان یک روند تحلیلی را بر اساس روابط فرم بسته تدوین نمود. در این تحقیق؛ مدل‌های مطالعاتی با دو سیستم قاب خمشی محیطی ترکیبی و دسته شده، بصورت سازه‌های 10 طبقه بوده که در پلان و ارتفاع، منظم می‌باشند. بازه تغییرات پاسخ‌های لرزه‌ای سازه‌های مطالعاتی توسط مدل فرم بسته ترکیبی دو کنسول خمشی- برشی محاسبه می‌‌شود. سپس این نتایج با پاسخ‌های بدست آمده از آنالیز‌های خطی و غیر خطی تاریخچه پاسخ تحت رکوردهای سه مولفه‌ای زلزله با ماهیت نیرومند جهت داری شکست، مقایسه گردیده است. درباره ویژگی‌های رکوردهای حوزه نزدیک می‌توان به باند فرکانس‌های پایین پر انرژی، وجود حرکت پالس گونه با پریود بلند، روند سریع آزاد شدن انرژی جنبشی ارتعاشات نیرومند زمین، اشاره نمود. نتایج این پژوهش بیانگر تخمین دست بالا و با دقت نسبی برای پارامترهای نیاز لرزه‌ای سازه‌های مطالعاتی است. Dynamic time history analysis methods are commonly used to determine the seismic responses of structures. Despite their ability to somewhat precisely estimate seismic demand, nonlinear dynamic methods require extensively complex computations and are sensitive to the nature of earthquake records. Nonlinear static analysis methods also estimate the seismic responses of structures within an error range. The continuum analytical model is an alternative computation method for estimation of the seismic demand of structures. If the seismic behaviour of a structure is modeled based on the interaction between the equivalent flexural and shear cantilevers, it is possible to develop an analytical procedure based on the closed-form equations. In this study, the studied models were prepared using a hybrid and a bundled moment framed tube skeletons as 10-story structures which are symmetric and regular with plan and height. The variations range of seismic responses of the studied structures was calculated using the closed-form model of flexural and shear combined cantilever. Then, these results are compared with the response parameters obtained from linear and nonlinear time history analyses subjected the three components earthquake records contain strong forward directivity effects. Some of the characteristics of near-field records are powerful low-frequency band, pulse-like motions with long periods, rapid release of kinetic vibration energy in a short period, and ratio of peak velocity to peak acceleration. This research results denote the presence of an overestimation on the seismic demand parameters with relative precision.
" Nonlinear Dynamic Response ", " Drift Demand ", " Bundled Tube ", " Hybrid Framed Tube ", " Three Component Record "
 Chopra, A.K. Goel, R.K. (2002). A modal pushover analysis procedure for estimating seismic demands for buildings. Earthquake Engineering and Structural Dynamics, 31, 561-582. Chopra, A.K. Goel, R.K. (2004). Evaluation of a modified MPA procedure assuming higher modes as elastic to estimate seismic demands. Earthquake Spectra, 20, 757-778. Sasaki, K.K. Freeman, S.A. Paret, T.F. (1998). Multi-mode pushover procedure (MMP) - a method to identify the effects of higher modes in a pushover analysis. In: Proceedings of the 6th U.S. National Conference on Earthquake Engineering, Seattle, Washington. Moghadam, A.S. (2002). A pushover procedure for tall buildings. In: Proceedings of the12th European Conference on Earthquake Engineering, Elsevier Science Ltd., London, England. Jan, T.S. Liu, M.W. Kao, Y.C. (2004). An upper-bound pushover analysis procedure for estimating the seismic demands of high-rise buildings. Engineering Structures, 26, 117-128. Rofooei, F.R. Attari, N.K. Rasekh, A. Shodja, A.H. (2007). Adaptive pushover analysis. Asian Journal of Civil Engineering, 8, 343-358. Kadid, A. Boumrkik, A. (2008). Pushover analysis of reinforced concrete frame structures. Asian Journal of Civil Engineering, 9, 75-83. Mahdi, T. Soltan Gharaie, V. (2011). Plan irregular rc frames: comparison of pushover with non-linear dynamic analysis. Asian Journal of Civil Engineering, 12, 679-690. Antoniou, S. Pinho, R. (2004). Advantages and limitations of adaptive and non-adaptive force-based pushover procedures. Journal of Earthquake Engineering, 8, 497–522. Antoniou, S. Pinho, R. (2004). Development and verification of a displacement-based adaptive pushover procedure. Journal of Earthquake Engineering, 8, 643–661. Poursha, M. Khoshnoudian, F. Moghadam, A.S. (2009). A consecutive modal pushover procedure for estimating the seismic demands of tall buildings. Engineering Structures, 31, 591–599. Poursha, M. Khoshnoudian, F. Moghadam, A.S. (2011). A consecutive modal pushover procedure for non-linear static analysis of one-way unsymmetric-plan tall building structures. Engineering Structures, 33, 2417–2434. Vafaee, M.H. Saffari, H. (2017). A modal shear-based pushover procedure for estimating the seismic demands of tall building structures. Soil Dynamics and Earthquake Engineering, 92, 95-108. Stafford Smith, B. Kuster, M. Hoenderkamp, J.C. (1984). Generalized method for estimating drift in high-rise structures. Journal of Structural Engineering (ASCE), 110(7), 1549-1562. Eroglu, T. and Akkar, S. (2011). Lateral stiffness estimation in frames and its implementation to continuum models for linear and nonlinear static analysis, Bulletin of Earthquake Engineering, 9, 1097-1114. Halis Gunel, M. and Emre Ilgin, H. (2007). A proposal for the classification of structural systems of tall buildings. Building and Environment, 42, 2267-2675. Miranda, E. (1999). Approximate seismic lateral deformation demands in multistory buildings. Journal of Structural Engineering, 125(4), 417-445. Miranda, E. Reyes, C.J. (2002). Approximate lateral drift demands in multistory buildings with nonuniform stiffness. Journal of Structural Engineering, 128(7), 840-849. Road, Housing and Urban Development Research Center, (2014). Iranian Standard No. 2800. 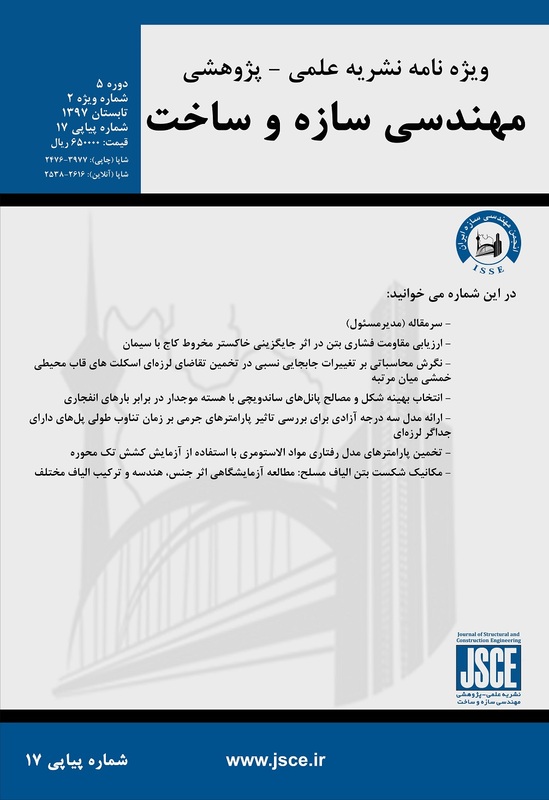 Iranian code of practice for seismic resistant design of buildings, Tehran, Iran. Road, Housing and Urban Development Research Center, (2014). Iranian national building code: Design Loads for Buildings – Division 6, Tehran, Iran. Road, Housing and Urban Development Research Center, (2014). Iranian national building code: Design and Construction of Steel Structures – Division 10, Tehran, Iran. FEMA 356 (2000). Pre-Standard and Commentary for the seismic Rehabilitation of Buildings. Washington D.C. Federal Emergency Management Agency, USA. Computers and Structures, Inc. (2000). Analysis reference manual for Sap2000. Berkeley-California, USA. Alonso-Rodríguez, A. and Miranda, E. (2015). Assessment of building behavior under near-fault pulse-like ground motions through simplified models. Soil Dynamics and Earthquake Engineering, 79, 47-58. Alavi, B. Krawinkler, H. (2004). Behavior of moment resisting frame structures subjected to near fault ground motions. Earthquake Engineering and Structural Dynamics, 33, 687-706. Sucuoglu, H. Nurtug, A. (1995). Earthquake ground motion characteristics and seismic energy dissipation. Earthquake Engineering and Structural Dynamics, 24, 1195-1213. Alavi B, Krawinkler H. (2000). Consideration of near-fault ground motion effects in seismic design. In: 12th World Conference on Earthquake Engineering (12WCEE), New Zealand Society for Earthquake Engineering, Auckland, New Zeland. Azhdarifar, M. Meshkat-Dini, A. Sarvghad-Moghadam, A. (2015). Study on the seismic response parameters of steel medium-height buildings with framed-tube skeleton under near-fault records. Electronic Journal of Structural Engineering (EJSE), 15, 70-87. Malhotra, P.K. (1999). Response of buildings to near-field pulse-like ground motions. Earthquake Engineering and Structural Dynamics, 28, 1309-1326. Anderson, J.C. Gurfinkel, G. (1975). Seismic behaviour of framed tubes. Earthquake Engineering and Structural Dynamics, 28, 145-162.